The Cooper Discoverer A/T3 4S is Cooper's newest all terrain tire designed for SUVs, crossovers and light trucks. The Cooper Discoverer AT3 4S comes in 37 sizes (from 15- to 20-inch rim diameters) to fit a variety of SUVs, CUVs, and light trucks. Designed with Adaptive-Traction Technology™, the Cooper Discoverer AT3 4S is designed to grip the road surface whether it is rocky or smooth, and under clear skies or severe weather. The Discoverer AT3 4S has a patented saw-tooth pattern to trap snow inside the grooves to offer superior snow-on-snow traction and stopping distance. A deep, uniquely-shaped center groove improves the Discoverer AT3 4S’s resistance to hydroplaning, and the smaller gauge zigzag sipes provide better stability and control and a better biting edge for wet/dry traction, while also reducing stone retention and drilling. 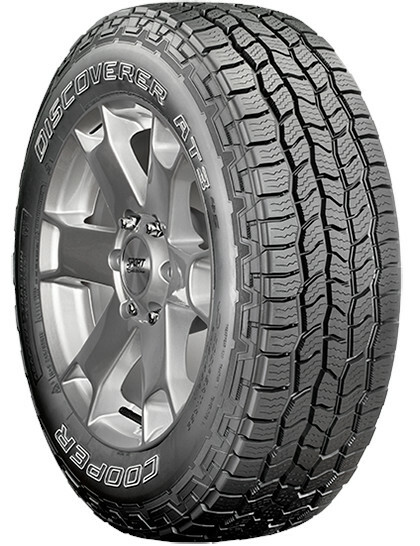 The Cooper Discoverer AT3 4S comes with a 65,000 mile treadwear protection warranty.